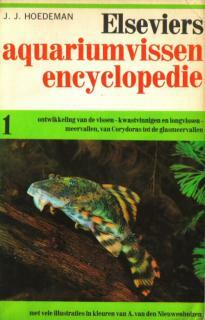 Subject Matter In English, the title means "Aquarium fish encyclopedia". This soft covered pocket contains 192 pages, with many colour and black & white pictures, several drawings and 17 catfish families given coverage. Being just one part of an encyclopedia consisting of six parts, this book starts with a general overview concerning all fishes but from page 68 onwards it's solely on catfishes. Already in 1968, the Callichthyids and Loricariids get the most interest. The other families get an average of 2 pages each, except for the Bagrids with 7 pages. The nomenclature is naturally outdated but that shouldn't be a surprise when you look at the age of publication. Actually, the surprise is that so many species are named and shown. The pictures by A. van den Nieuwenhuizen are very worthwhile. I bought the complete encyclopedia set second hand many years ago for approximately 9 euros. I've only kept this part because it is about catfishes and thus suits my collection. Buy or not? Yes, for little money this book should be bought if only for the pictures.